QUITO (AFP) ― Think Galapagos and you think nature in its most pristine expression. But the destructive weather phenomenon called El Nino turns coral reefs there a sickly white and sea iguanas scrawny. And now, in an unprecedented experiment, scientists using unmanned submarines in the waters off the Ecuadoran archipelago are probing whether global warming is related to El Nino. There is not yet conclusive evidence of a link. But experts are very serious about the possibility that climate change is making El Nino ― unusually warm water in the Pacific off the west coast of South America ― more frequent and more intense. 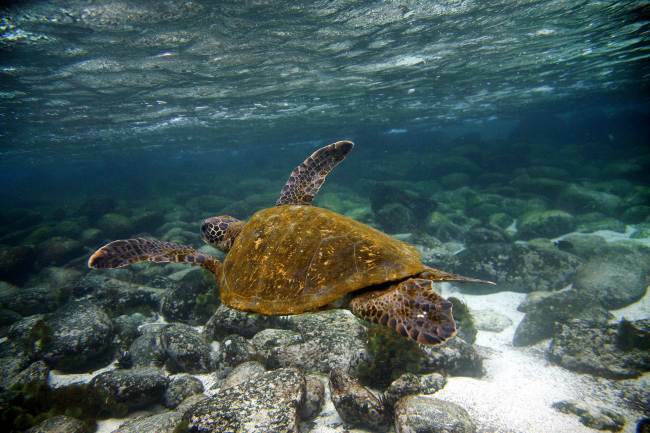 A Green sea turtle (Chelonia mydas) swims underwater near San Cristobal island, Galapagos archipelago. For hundreds of years, the weather system at the Galapagos was not threatened by global warming, said Eduardo Espinoza, head of maritime research at the Galapagos National Park. But climate change associated with human activity could turn El Nino into a death sentence for several marine species that are unique to the archipelago. With future studies, it will become clear if global warming is making El Nino nastier and more frequent, said Espinoza. Located 1,000 kilometers off the coast, the Galapagos Islands ― the natural laboratory that inspired Darwin’s theory of evolution ― every now and then suffer with the arrival of El Nino. Besides warmer water, the phenomenon is also characterized by heavy rains and weaker winds. Scientists from Ecuador’s Navy Oceanographic Institute, working with U.S. organizations like the Woods Hole Oceanographic Institution and The Scripps Research Institute, launched robot subs late last month to learn more about the weather quirk. For two years, six subs will submerge in the Galapagos sea to collect data on what is known as the Cromwell Current, an underwater stream that helps nurture the food supply in the waters and is involved in El Nino, said INOCAR’s Captain Wellington Renteria. “El Nino has ravaged the Galapagos. In particular, the rise in temperature has caused almost all the coral reefs to disappear,” he said. Organizations like the International Program on the State of the Ocean and the International Union for Conservation of Nature warned in October that the world’s oceans are getting hit with a three-pronged punch: global warming, deoxygenation and acidification. After Australia, the Galapagos Islands ― declared part of the world’s nature heritage ― has the planet’s largest marine reserve on the planet at 133,000 square kilometers, the park says. Between 1982 and 1998, El Nino made a mess of the archipelago and left a trail of death: colorful coral colonies turned white, and a dramatic drop in the populations of endangered penguins, cormorants, sea lions and marine iguanas. Some species died of hunger because the algae they feed on disappeared temporarily. El Nino reduces the sea’s productivity, and each group of creatures takes years to recover. So the more El Ninos there are, the less time the species have to restore themselves. “With the marine iguanas, we found something very interesting because with the El Nino phenomenon, they shrink. They lose weight. In height, they are as many as five centimeters (two inches) shorter,” said Judith Denkinger from the Institute of Ocean Sciences at the University of San Francisco in Quito. After each chapter of El Nino, the frequency of which can vary between two and eight years, species take from 15 to 30 years to recover ― in other words, to re-establish a balance between births and deaths. But the probability that a new phenomenon will hit the islands hard during that rehab stretch “is very large, which basically means the population is headed toward extinction,” said Denkinger, a Galapagos marine life expert. The archipelago is at a spot where several currents and sub-currents converge. This explains the richness of marine life. One of these is the undersea Cromwell Current, which drags in nutrients that form a huge food chain. While that subcurrent is being studied, along with its ties to El Nino, marine life at the Galapagos is deteriorating more quickly than life on the islands themselves despite conservation efforts. “The marine part is not in good shape at all,” said Denkinger.